Is the damage we’re doing to our planet literally leaving you sick, sore, and gasping for air? Want to take back our inalienable rights to clean air, clean water, and healthy food? In this quietly revolutionary book, environmental pioneer and founder of Greenopia, Gay Browne, shares a roadmap for making incremental changes that will not only transform your life, but heal the world we share. Environmental pioneer Gay Browne is the world’s first and only personal environmental therapist and is the founder of Greenopia, a company dedicated to achieving personal and community environmental health through small and large habit and behavioral adjustments. Greenopia is a comprehensive bestselling series of city by city guidebooks listing local eco-friendly resources. Greenopia Los Angeles was a Los Angeles Times bestseller. Gay travels the country speaking on environmental issues, sits on several boards, and holds various chair positions for environmental alliances, arts, and hospital foundations, and women’s and school groups. She lives in Santa Barbara, California, with her children and dogs. 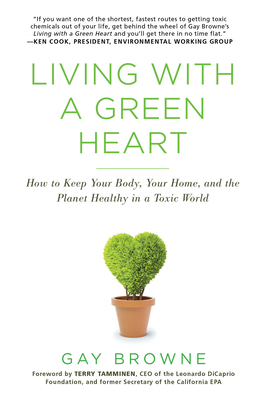 For more information, and tips on how you can live with a green heart, visit her website at GayBrowne.com.